Fans of the original (now $299) iPad mini will be excited to know that the shape of the new version is essentially unchanged. This thing is a dead ringer for its non-retina sibling. It's three-tenths of a millimeter thicker than the old model, and if you pick up the original mini followed immediately by the new one, you'll notice that it's slightly thicker. Accessories for the iPad mini should generally fit this new model, unless they're remarkably exacting in their size. Apple's $69 iPad mini Smart Case, for example, is rated for either model. I was able to use my old, tea-stained iPad mini Smart Cover on the new model with no trouble. They're the same, within a reasonable margin of error. 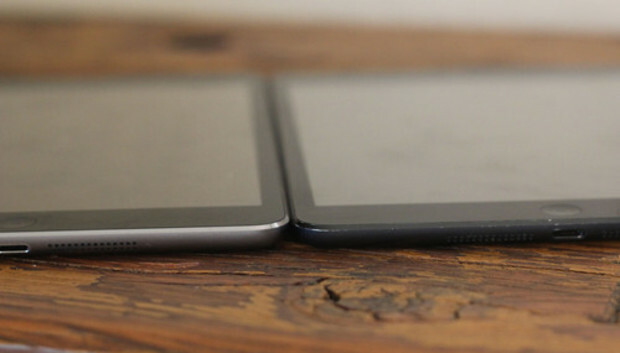 Though the new iPad mini with Retina display is lighter than the iPad Air, it's actually more dense. Picking up the iPad Air feels a bit like picking up a movie prop; like the iPhone 5 series, it's almost impossibly light. The Retina iPad mini definitely feels more solid, like a whole lot of technology got packed into a very small space. And that's an accurate impression: This is a device that's only slightly larger and heavier than the non-retina iPad mini, but has a full-on Retina display and a modern A7 processor. In a year, Apple has taken a device that was small and light but equipped like an iPad 2, and replaced it with one that's still pretty small and light, but feels more like an iPad Air. There's a whole lot packed in that small space. The screen itself is just what you'd imagine: A beautiful, bright display that packs every pixel found on the 9.7-inch iPad Air display into the mini's 7.9-inch size. That means that the Retina iPad mini's screen packs 326 pixels into every square inch, compared to 264 ppi on the iPad Air. The number of dots is the same; only the size of the screen is different. As a comic-book reader, I've been curious about how well the Retina model of iPad mini would fare when it came to reading comics. I read a few issues of Hawkeye and Saga using the Comixology app, and I have to say that I'm impressed. If you're someone who is getting older and really prefers larger images, you'll prefer the iPad Air, but my eyes have not yet degraded to that point. I found the comic text crisp and clear in a way that it just wasn't on the original iPad mini, and of course the high-resolution display really shows off comic art. There is one, however: The A7 processor in the iPad mini with Retina runs a little bit slower than the one in the iPad Air. My guess is that Apple has done this to extend battery life or prevent overheating or both, but the iPad Air's A7 is running at 1.39GHz while the iPad mini's is running at 1.27GHz. The net result of this: The iPad mini with Retina is vastly faster than the non-Retina model, but it's a tad slower than the iPad Air. (I couldn't see much evidence in actual use of the product, however; it's possible that some future power-hungry app will expose the difference between the two devices in terms of power, but really, they're both plenty fast.) The iPhone 5S, which also has the advantage of having to draw fewer pixels on its display than either Retina iPad model, also scored faster than the iPad mini with Retina. Meanwhile, the difference in speed between the iPad mini with Retina and the original iPad mini is dramatic. GeekBench scores for the Retina were five times that of the original; in the Web-based tests the Retina scores were roughly three times that of the original. Speaking of heating and overheating, I've heard from a lot of iPad users who seem really concerned that the iPad mini with Retina display is going to get too hot. Is this a reaction to all those stories about the iPad 3 running hot, way back when? Maybe. Anyway, I tried a bunch of stuff on the Retina iPad mini and the hottest it ever got was slightly warm. This doesn't seem to be an issue, but I'll keep checking. So, for the record: The iPad Air is slightly faster, has a bigger screen (but not a higher resolution), is larger and heavier, and costs $100 more. Which one's right for you? It seems to me that the most important parts of the comparison will be screen size (do you want everything just a little bit larger? ), physical size (do you want the smallest iPad possible? ), and price. I'm not sure where I'm going to come down on those issues, but they seem to be the most important ones. There's much more to come, including our full review and a bunch of battery testing. In the meantime, send any questions you've got to me on Twitter (I'm @jsnell) or post in the comments here.